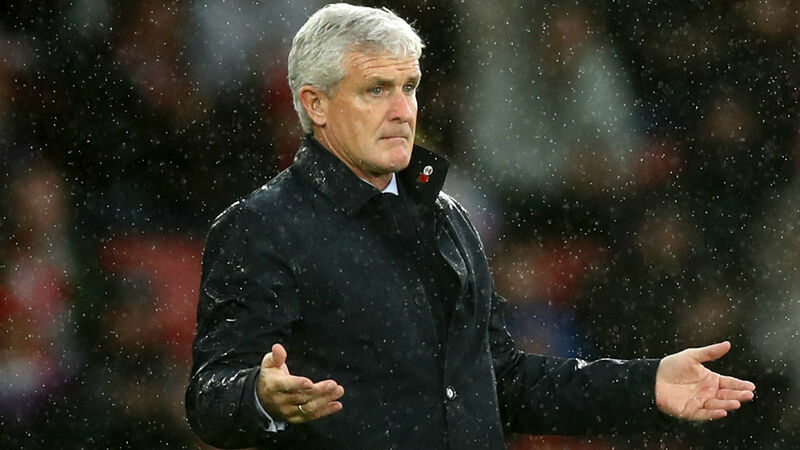 Southampton boss Mark Hughes has claimed the Premier League is stuck "in the dark ages" for their failure to introduce VAR this season. Hughes' side were pegged back to a 1-1 draw by Watford on Saturday, with Jose Holebas' late goal cancelling out Manolo Gabbiadini's opener. But controversy reigned before Watford's equaliser, with Charlie Austin having what looked to be a perfectly valid goal disallowed when referee Simon Hooper deemed that Maya Yoshida, who was in an offside position, had made contact with the striker's effort. Austin launched a scathing attack on the officials in his post-match interview with Sky Sports, and Hughes echoed his player's views, adding that the Premier League must make use of technology. "It needs to come in," Hughes told a news conference. "I was surprised that they didn't introduce it this year, I think a lot of people were. "All the other competitions have introduced it quickly, all other sports have video reviews. "For some reason, the Premier League is still in the dark ages." Referee Hooper is inexperienced at the highest level, and Hughes insisted that Professional Game Match Officials Limited (PGMOL) would not have allocated a high-profile fixture to the official. "We've been given an inexperienced referee today," Hughes said. "He's had four games. For us, our game is just as significant as the Manchester derby is to Manchester City and Manchester United. "Would PGMOL have given that game to him? Absolutely not. But to us this game is more important. "To have a referee that on the day wasn't quite up to the standard required is hard to take. Everybody who sees the incident will have to say I've got a decent case." Watford also fell the wrong side of a refereeing decision, with Ryan Bertrand bringing Nathaniel Chalobah down inside the area, only for the officials to dismiss the visitors' penalty appeals. And although Javi Gracia emphasised the difficult job referees and their assistants have during games, he acknowledged his frustration at not getting the decision. "There were different situations that were difficult for the referee," he told BBC Sport. "But after 50 minutes, it was a clear penalty, maybe a second yellow for Bertrand, maybe the game changes. "I always support the referee because I know the how difficult the job is."